Remember those awesome looking Adobe Touch Apps that we saw back in October? Well they have finally reached the Android market for Tablets running Android 3.1 and above, and there are a total of 6 of them available. Each of them are available as individual purchases from the Android market for $9.99 apiece, and you can select between Adobe Photoshop Touch, Adobe Collage, Adobe Ideas, and a few others. Offering a wide variety of features, each of the applications is designed to do something a bit different, so be sure to hop into the Android market and check out the applications, and figure out which is best for you! Hit the break for the full release. SAN JOSE, Calif., — Nov. 15, 2011 — Adobe Systems Incorporated (Nasdaq:ADBE) today announced the availability of the Adobe Touch Apps in the Android Marketplace. Adobe® Touch Apps are a family of six intuitive touch screen applications, inspired by Adobe® Creative Suite® software, to bring professional-level creativity to millions of tablet users. Designed to work with both finger and stylus input, the apps address multiple areas of the creative process: Adobe® Photoshop® Touch for image editing; Adobe® Collage for moodboards; Adobe® Debut for presenting and reviewing creative work; Adobe® Ideas for sketching; Adobe® Kuler® for exploring color themes; and Adobe® Proto for web site and mobile app prototyping. Announced at MAX 2011 in October, the apps are available today for Android 3.1 or higher. Adobe Ideas is already on iOS and Adobe expects iOS versions of the other 5 apps to be available in early 2012. In addition to availability as individual apps, Adobe Touch Apps will be essential components of Adobe® Creative Cloud™ membership, a new initiative expected in the first half of 2012. Creative Cloud membership will be a worldwide hub for creativity, where users can access desktop and tablet applications, find essential creative services, and share their best work. Files created via Adobe Touch Apps will be able to be shared, viewed across devices or transferred into Adobe Creative Suite software for further refinement– all key features of Adobe’s vision for the Creative Cloud*. 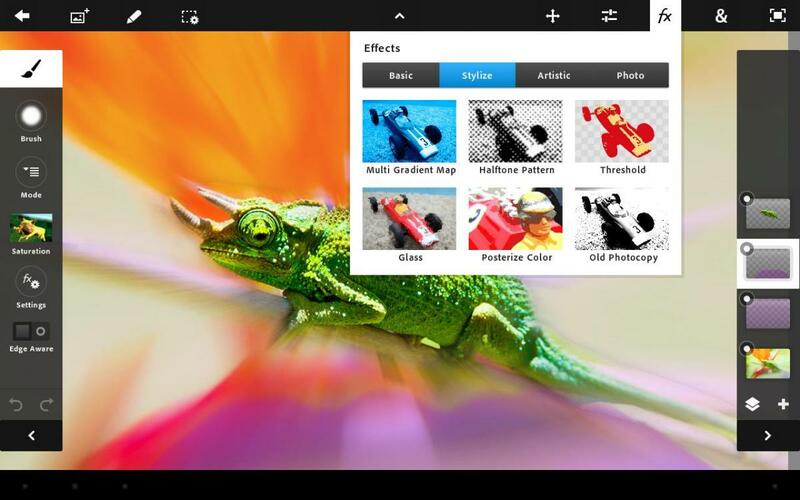 Adobe Photoshop Touch lets users transform images with core Photoshop features, in an app custom-built for tablets. With simple finger gestures, users can combine multiple photos into layered images, make essential edits, and apply professional effects. The tablet-exclusive Scribble Selection Tool allows users to easily extract objects in an image by simply scribbling on what to keep and, then, what to remove. With Refine Edge technology from Adobe Photoshop, even hard-to-select areas with soft edges are easily captured when making selections. Additionally, the app helps users quickly find images, share creations, and view comments through integration with Facebook and Google search. Using Adobe Creative Cloud, files can be accessed and opened in Adobe Photoshop installed on a different machine. Adobe Collage helps creatives capture and refine ideas and concepts by allowing them to combine inspirational images, drawings, text and Creative Suite files into modern, conceptual moodboards. Features include importing of images, four customizable pen types for drawing, adding text, and applying color themes. A virtually unconstrained canvas grows as needed to accommodate more assets. Files can be shared or transferred for access in Adobe Photoshop. Adobe Debut allows users to present designs to clients and stakeholders virtually anywhere. Adobe Debut quickly opens tablet-compatible versions of Creative Suite files for convenient and beautiful viewing on the tablet, including Photoshop layers and Illustrator art boards. Feedback is gathered using a markup pen tool to add notes and drawings on top of the work. Adobe Ideas is an easy-to-master, vector-based tool for drawing. By using a stylus or finger, strokes appear smooth at any zoom level. Starting with a blank canvas, users can choose color themes, and pull in tablet-compatible image files that can be controlled as separate layers. Finished results are easily accessed in Adobe Illustrator or Photoshop. Adobe Ideas is also currently available for iOS. To learn more about the Adobe Touch apps, please visit Adobe.com, Adobe TV, Facebook, Twitter or the Creative Layer blog. The new Adobe Touch Apps follow the launch of Adobe Carousel™ for iPad, iPhone, iPod touch and Mac OS – an all-new way to browse, enhance and share photos across devices. The six Adobe Touch Apps for creative professionals are immediately available on the Android Market, at an introductory price of $USD 9.99 each. The Touch Apps are available in most geographies in English. The Adobe Touch Apps will run on tablets running Android 3.1 or higher with a minimum 8.9”screen size and resolution of 1280 x 800. Adobe Ideas is currently available in the iTunes App Store for $USD5.99. Adobe expects iOS versions for all Touch Apps to be available in early 2012. The Adobe Touch Apps integrate with the creative file viewing, sharing and transfer features of the Adobe Creative Cloud also made available today. More information regarding the additional capabilities of Adobe Creative Cloud, including applications, services and community and full Adobe Creative Cloud paid membership options will be available in the first half of 2012.